Very often I am asked if people ever react badly to taking their photograph on the street. The answer is that it is very rare. I have developed a sense for those whose pictures I can take and those who it is better to avoid. Also, most of the time I am discreet and tend to capture candid moments. I always try to be respectful and non-intrusive. If there is an exchange with someone, I will show them the image I have taken and again it rare that they ask me to delete the image. The Bruce Gilden types who think it is cool to pounce on people, blind them with a flash and snap the reaction and call it art, I just do not get. Gilden does it well, but the wannabes who try to imitate him need to be rounded up and reconditioned. 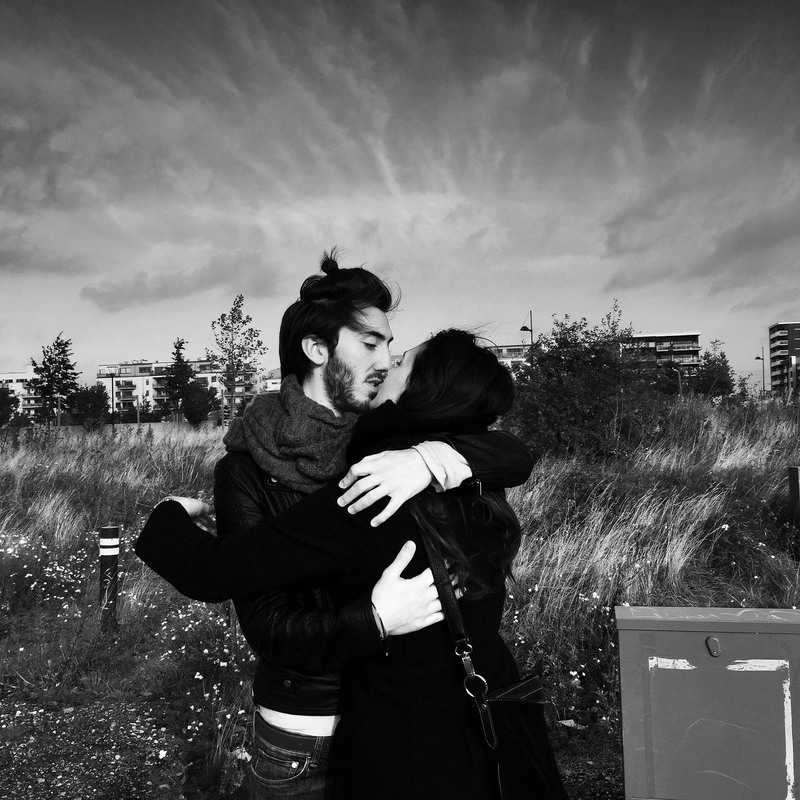 This image of a couple kissing I took when I was cycling around Malmo – a short 25 minute train journey from Copenhagen. I saw them embracing from a distance and as I approached on the bike they were still in each other’s arms. Instinctively, I had the iPhone ready to snap and did a cycle-by shoot, capturing their embrace. I got two images. Pocekted the iPhone and cycled on. When I was about a hundred metres beyond them I glanced around and saw that guy was running after me with his arm extended and appeared ready to launch whatever was in his hand at me. Thankfully, when he saw me looking at him, he refrained. I cycled on. Later, as I was cycling around I was a little anxious in case I would bump into the guy again. Clearly, he was not happy with my taking their photograph when they were in an intimate moment. But the thing was with each couple I saw I was not sure if it was my guy. I could not remember what he looked like and had to check the phone to see. Fortunately, I did not bump into him again. I wonder what he was trying to launch at me. 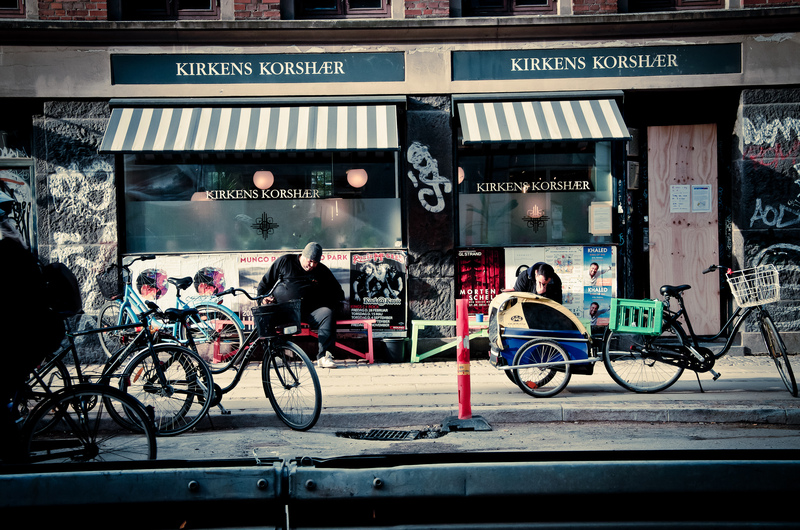 Here is another image taken as I was cycling around, this time in Copenhagen. This street, near the train station, had a lot of down and outs, poor people down on their luck. There seemed to be a lot of strung-out junkies. When I first cycled up the street I saw this fat man doubled over, his head bobbing as he struggled to stay upright on the bench he was sitting on. With the passing traffic it was difficult to get a shot of the scene. I waited until I was cycling back down the street. He was still there, still struggling to balance on the bench. This entry was posted in Daily posts to Flickr, iPhone, photograph posts, Street Photography and tagged art, black and white photography, Brendan Ó Sé, Bruce Gilden, Copenhagen, Copenhagen Street Photography, iPhone, iphoneography, Kissing, love, Lovers, Malmo, mobile photography, people, photography, street photography, travel.